Vaporizing cannabis can be a much better alternative to a joint. Vapor contains fewer harmful substances than smoke, and will provide you with a purer experience so you can enjoy more of the “good stuff” in cannabis. But the right temperature when vaporizing can make a big difference, not just for flavour, but also for your health. Sure thing, smoking a good old joint is a timeless ritual—but vaporising has many benefits. For starters, vaporizing is healthier than smoking. Vaporizing doesn’t combust your herb, so you’re inhaling fewer of the harmful toxins present in smoke. Vaping also makes for a purer cannabis experience. The smoke from your joint only contains around 10% of cannabinoids (the “good stuff”) in cannabis—the rest is a combination of unhealthy byproducts. Vapor clouds contain as much as 95% of the goodies from your weed. This makes them very pure and a lot more potent. But know that when using a vaporizer, the right temperature setting can make all the difference! One way to get to know your vaporizer well, is to just play around with the temperature settings - after all, it‘s pleasant research. But a slightly more scientific approach is to get to know the boiling points of the different cannabinoids and their properties. Now that‘s fun applied science! Setting your vaporizer to the right temperature is important for several reasons. If you set the temperature too low, you will be missing out on flavour and potency. The crucial compounds found in cannabis and other herbs require a certain minimum temperature to “activate”. If your vaporizing temperature is set too low, you’re not getting the full potential out of your precious buds or concentrate. On the other hand, if you set your vaporizing temperature too high (especially at temperatures higher than 230°C (446°F), this can degrade active substances in weed like terpenes and cannabinoids. Not only will the potency and flavour of your vape be adversely affected, but you may also inhale more toxic compounds detrimental to your health. 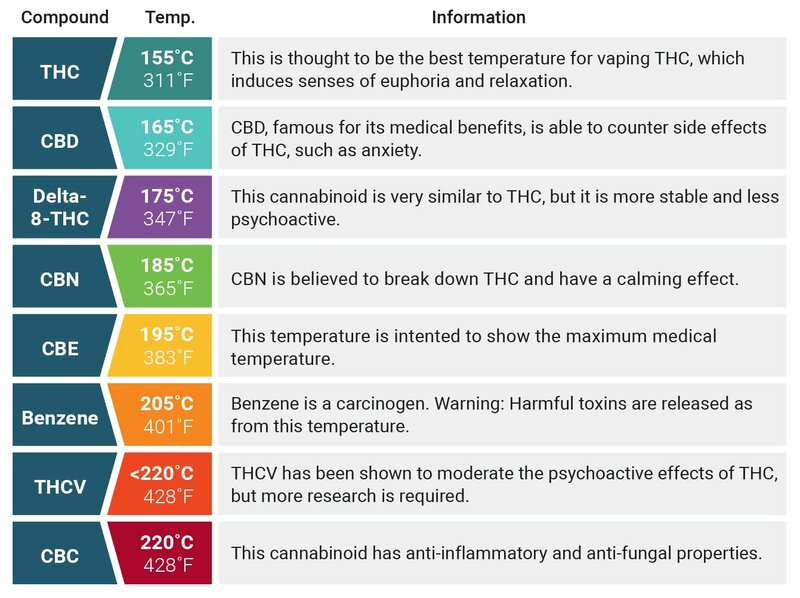 Before exploring the depths of cannabinoid boiling temperatures, here are the key findings: There‘s a temperature range in which different compounds of cannabis are released, each showing unique qualities in effect. While only experimentation will show you the high that suits you best, an ideal temperature to extract a wide range of psychoactive compounds is 185 °C. The optimal temperature range for cannabis is between 180 - 210 °C. Temperatures below 190 °C. tend to produce a more cerebral high, temperature above that tend to induce a body high. The range of temperature in which all cannabinoids evaporate lies between 157 and 220 degrees Celsius. As all cannabinoids have different boiling points, vaporizing the same bowl of herb at different temperatures will generate different results. In general, there‘s two main effects which we will call the “buzz high” and the “body high”. As mentioned above, lower temperatures will have more of a heady effect, whilst higher temperatures will have a more body load effect. THC 157°C It has both euphoric and analgesic effects, inducing a great sense of relaxation. CBD 170°C CBD, famous for its medical benefits, is able to counter side effects of THC, such as anxiety. Delta-8-THC 175°C This cannabinoid is very similar to THC, but it is more stable and less psychoactive. CBN 185°C CBN is believed to break down THC and have a calming effect. CBC 220°C This cannabinoid has anti-inflammatory and anti-fungal properties. THCV 220°C THCV has been shown to moderate the psychoactive effects of THC, but more research is required. Along with terpenoids, flavonoids are little known compared to the famed cannabinoids. Flavonoids are a large class of plant pigments that are sometimes referred to as Vitamin P. Terpenoids and Flavonoids are partly responsible for the looks, taste and smell of a particular strain. They are the reason we open the zip lock before we buy, because their smell reveals a lot about the character of the plant. They are also thought to have secondary health benefits. The following outlines both the effects and the temperatures at which the flavonoids vaporize at. Beta-sitosterol 134°C This flavonoid is thought to have anti-inflammatory qualities. Apigenin 178°C Apigenin is thought to be estrogenic and have anti-inflammatory properties. Cannflavin A 182°C This flavonoid is a COX inhibitor. Quercetin 250°C Quercetin is an antioxidant and anti-viral flavonoid. Terpenoids are structurally related to terpenes and are naturally occurring in a wide range of plants. In part, they contribute to what what gives plants their unique aromatic quality. The scent of cinnamon, cloves and menthol are examples of well known terpenoids. In fact, the strongest known naturally occurring psychedelic compound - Salvinorin A - is a terpenoid. The following descriptions outline both the effects and boiling points of terpenoids. Beta-caryophyllene 130°C Thought to be anti-inflammatory and anti-malarial. Alpha-terpinol 156°C This terpenoid is an antioxidant, sedative, antibiotic and anti-malarial. Beta-myrcene 168°C This is analgesic, an antibiotic and anti-inflammatory. Delta-3-carene 168°C This terpenoid has anti-inflammatory properties. 1,8-cineole 176°C Increases cerebral blood flow and acts as a stimulant. D-limonene 177°C D-limonene appears naturally in cannabis. P-cymene 177°C P-cymene is an antibiotic and an anticandidal agent. Linaloo 198°C This is an antidepressant, sedative and immune system potentiator. Terpinol-4-ol 209°C This is an antibiotic and an AChE inhibitor. Borneol 210°C Borneol is an antibiotic. Alpha-terpineol 217°C This terpenoid is a sedative, antibiotic, antioxidant and AChE inhibitor. Pulegone 244°C Pulegone is a sedative and potentially has memory boosting properties. WHAT ABOUT TOXINS WHEN YOU ARE VAPORIZING? Vaping is a lot cleaner than smoking, but this doesn’t mean it’s devoid of any potentially harmful substances. There is still the possibility of inhaling toxins, albeit in dramatically reduced concentrations. Moreover, unless you source your weed from a legal establishment—or grow it yourself—there could be small amounts of herbicides or pesticides still present in the plant material. After all, unless you are growing your own weed, how do you know what was used to grow it? And then there is also the possibility that the material your vaporizer is made of may contain something that you don’t want in your body either. What’s important to know is that setting your vaporizer to temperatures above 200°C (392°F) means you are approaching combustion temperatures. This is the point where the undesired substances in your plant material or vaporizer are released. Because of this, it is best to avoid high vaporizing temperatures unless necessary. In the table below, you can see which toxins are released at which temperatures. WHAT TO DO IF YOUR CANNABIS IS TOO MOIST OR TOO DRY? Unlike when you use a bong or smoke a joint, bone dry cannabis can still be a delight in a vaporizer. However, because it is so dry, it will vaporize much faster – if it is too hot you run the risk of flash boiling the active ingredients, eliminating taste and flavour. As it is largely going to depend on the situation and cannabis strain you are using, there is no definitive guide to how to properly vaporize particularly dry weed; but as a rule of thumb you will want to reduce the temperature from your norm, going lower the drier it is. Conversely, if your bud is fresh, then it may be very high in moisture. As a result, it can sometimes be hard to get cannabinoids out. To deal with this, it is recommended to do what‘s called a flavonoid run. By putting the vaporizer at a lower temperature (around 138 – 148 °C. ), it is possible to gain a bag of flavonoid vapour whilst slowly drying out your cannabis a bit. After this run, your cannabis should be dry enough to vaporize efficiently at THC and other cannabinoid temperatures.